Now you can make cleaner, more accurate spherical angles in pipe and tubing at home or in the pits with the Proform Tubing & Pipe Notcher. 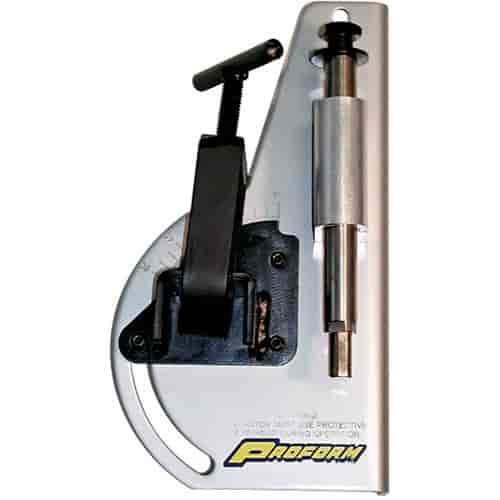 This quality tool is made of high grade aluminum and is built to last. It allows for adjustments from 0° to 45° in 1 degree increments. 66482 is rated 4.7 out of 5 by 3. Rated 5 out of 5 by BrandySC from Great tool! I purchased this for my husband for Christmas! Now he’s putting his cage together and he loves it! Rated 5 out of 5 by vinny1981 from Works Great! Great product at a great price, notcher works flawless! Rated 4 out of 5 by GOODFIRE from work good, not great. I feel it is a good value for the money. Make sure to have some extra tubing to make several practice cuts and get the device set up accurately. A small issue that occurs is, after the cutter cuts the top half, it begins to walk a few degrees off center. I corrected this by slightly tilting the tubing on set up about 2 degrees.